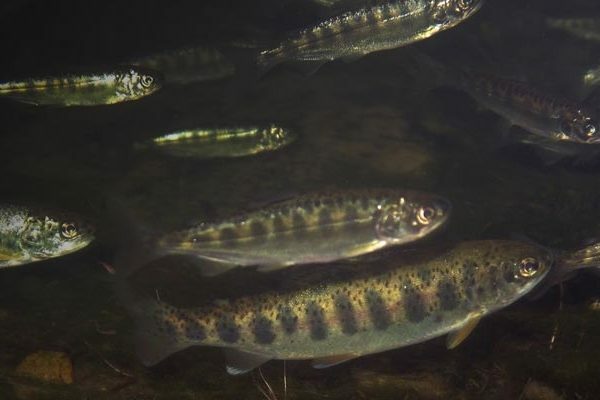 Does protecting salmon population diversity now pay harvest dividends in the future? Declines in Chinook salmon from the Kuskokwim and Yukon River basins of Western Alaska and the Yukon Territory have severely limited harvest opportunities for the dozens of communities that depend upon these salmon for subsistence and cultural needs. Returns have been so low in some recent years that recreational and commercial fishing has been closed and many communities have voluntarily stopped subsistence fishing. Chinook from these large river basins spawn in 100s of individual spawning streams each of which is likely to differ in productivity and carrying capacity due to local adaptation and limited rearing and spawning habitat. This “biocomplexity” is believed to be critical to maintaining resilience to environmental change and dampening variability in harvest for fisheries as a result of the so called “portfolio effect”. Despite its potential importance this biocomplexity is not currently considered in salmon fishery management in Alaska. For the past 2 years we have led a team of scientists from resource management agencies and universities, and worked with local subsistence fishers and managers, to combine empirically grounded statistical and simulation modeling with fishery and stakeholder engagement and harvest policy analysis to answer two interrelated questions: (1) what is the trade-off relationship between long-term harvest rates and population diversity in the Kuskokwim and Yukon river basins? ; and (2) how well do a range of alternative management strategies (focused on spawner goals) protect population diversity, provide consistent opportunities to meet subsistence harvest needs and achieve other fishery management objectives? Our work has highlighted a key, and previously ignored, trade-off between sustainable harvest and the protection of population diversity in salmon management in large river basins in in Alaska. Understanding this trade-off has uncovered a hidden benefit of protecting biodiversity: protecting population diversity now has the potential to pay harvest dividends in the future. These insights have begun to be taken in to consideration by local stakeholders involved in fishery management decision making processes with state and federal agencies and have advanced our thinking more broadly about the benefits of the protection of salmon population diversity for the peoples, economies and ecosystems that depend it.